Let me first draw your attention to the image below. While it is difficult from a computer screen to detect the subtle texture, colour and lustre, the textile sample shown here is a woven fabric rather than an embroidered piece. 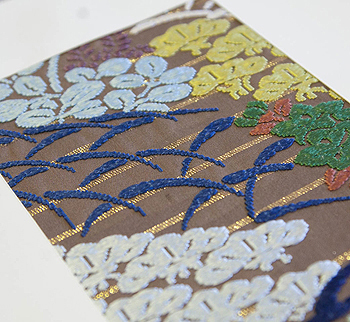 This is one of 15 textile samples in the Lisa Sainsbury Library holdings entitled ‘History of Textiles’ (Orimono no henyō) produced by Kawashima Textile Manufacturers Ltd. (present day Kawashima Selkon) in 2001. The 15 exquisite fragments are reproductions of rare Japanese cloths made between 7th to 18th century. The folding case containing the samples is jewel like in itself. With hand-written title strip reading ‘History of Textiles: Collection of 15 fabric examples’, the weighty box is covered in dark blue silk with geometric woven patterns of gold, ochre, green and blue. The 15 fabric pieces are each individually mounted, numbered and wrapped in sturdy pale green paper. When the wrapping is removed, a short explanatory text on the historic significance of the cloth is presented. Beneath the description is an additional layer of thin paper. The mounted fabric is finally revealed when this last layer is lifted. The textile samples are divided into four categories. Reproduction of textiles made during Asuka and Nara periods housed in Hōryūji temple (Buddhist temple constructed in Nara in 607) and Shōsōin (Treasure house of Tōdaiji temple holding art and traditional craft objects collected during the Nara period). Reproduction of fabric used for official court ceremonies during 9th to 14th century. Reproduction of textiles used by the daimyos for wrapping tea ceremony utensils with Chinese influenced designs made during late Muromachi and mid-Edo periods. Reproduction of textile used in Noh costumes from around 14th to 18th century. 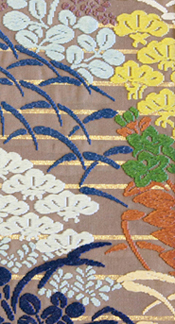 The image shown above is from album 14 and is an example of a kara-ori style textile used in Noh costume. The maker of these samples, Kawashima Textiles, celebrated its 170th anniversary last year. Purveyor of fine textiles, the merchant originally began trading in Kyoto in 1843. The company has since become one of the most distinguished with clients including the Tokyo Kabukiza Theatre. In recent years Kawashima produced three of the four drop curtains, essential for kabuki theatres, for the newly refurbished Tokyo Kabukiza that reopened with much anticipation in 2013. Historically, the company has played a central role in fronting Japanese cultural development. For example, Kawashima was enlisted to produce a wall tapestry to demonstrate Japan’s manufacturing innovation and advancement at the 1900 Paris Exposition. The tapestry was then purchased by the Imperial Household Ministry (present day Imperial Household Agency), which was later gifted to the British Royal Family. 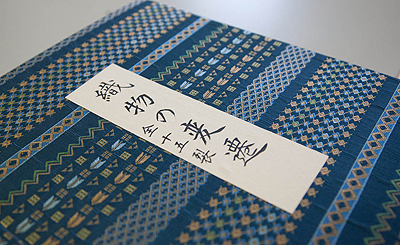 Prestigious tales such as these and more attest to Kawashima Textiles’ cultural and artistic prominence through the ages, complete with Imperial Family endorsement. Folding case containing textile sample albums. In 1993, Kawashima Textiles was approached by Shōsōin Repository office of the Imperial Household Agency to reproduce treasures in Shōsōin, an 8th century treasure house that once belonged to Tōdai-ji in Nara. From the following year and over the course of ten years, Kawashima Textiles developed ways of accurately reproducing rare historic textile examples from Shōsōin treasure house now in the care of the Imperial Household Agency. To do so included using a particular type of silkworm cultivated by Empress Michiko to recreate the original historic textile. While the Jōdai-gire (albums 1-6) samples in the ‘History of Textiles’ is not from the original Shōsōin reproduction project, the inclusion of them in the compilation testifies to the extensive knowledge, skill and experience Kawashima Textiles have in creating authentic historic textile resources. The ‘History of Textile’ album sets were originally given to the Japanese Department Stores Association by Kawashima Textiles. Amongst the sets, one was donated to the Lisa Sainsbury Library through the generosity of Sir Hugh and Lady Cortazzi who themselves received the album at some point as a gift. How the set was used while in the association’s possession is difficult to ascertain. What is certain, however, is that the beautifully reproduced collection of rare textile samples, now part of the Sainsbury Library collection, has enabled access to a wider European audience. Chūjō, Riichirō. Kawashima Orimono Shiryōshitsu o tazunete. Kagaku kyōiku (vol. 27 (1979) no. 1) p. 22-23. Dōmyō, Mihoko. Kinu bunkaken, Yōmō bunkaken. Ningen—netsu kankyō-kei shinpojiumu hōkokusho (dai 16-kai) p. 27. Fuji, Yoshiyuki. Tsuzureori no bi o motomete : Kawashima Orimono no ayumi. Gekkan senshoku α (vol. 256) 2002.7. Kōya, Masashi. Kodai no orimono gijutsu. Sen’i kikai gakkaishi (vol. 51 (1998) No. 2) p. 45-48. Mori, Katsumi. Mayu (Koishimaru) o mochiita Shōsōin-gire no fukugen mozō. Shōsōin kiyō (vol. 27, 2005) p. 1-46. Ogata, Atsuhiko. Gendai ni yomigaeru Shōsōin senshoku. Nihon shiruku gakkaishi (vol. 16, 2007) p. 118-121. Ogata, Atsuhiko. Shōsōin senshokuhin no kenkyū. Kyōto : Shibunkaku, 2013. Sakamoto, Kazuko. Kodai no ori gijutsu. Sen’i gakkaishi (vol. 55 (1999) No. 7) p. 235-239. Sawada, Mutsuyo. Tōkyō Kokuritsu Hakubutsukan shozō Shōsōin kankei shiryō no kenkyū : ‘Shōsōin gire’ o chūshin. Tōkyō : Tōkyō Kokuritsu Hakubutsukan, 2011. Yokohari, Kazuko. Nishiki no hanashi. Yōji no kyōiku. (vol. 71 (1972) No. 8) p. 54-61. Exposition kaiko : la sériciculture Impériale du Japon. [Tōkyō] :Bunkachō, 2014. Kawashima Orimono Bunkakan. Kyoto : Kawashima Orimono, 1993. Kyō no dentō to mon’yō (vol. 2). Kyōto :Bi no Bi, 1978. Airi Matsumoto, Kawashima Selkon Textiles Co., Ltd.